Deliberately routing users via a longer or more circuitous route is found in many forms (with a variety of intentions) from misleading road signs, to endless click-through screens, splitting up articles, periodic rearrangement of supermarket shelves, and so on. This kind of forcing function can also be used to increase the likelihood of users reading ‘important’ information; as always, there is an agenda behind the design decision. 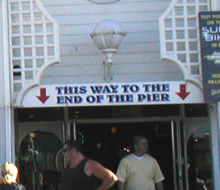 But it’s rare to see something quite as blatant as the above “This way to the end of the pier” sign on Brighton Palace Pier, attempting to persuade visitors to walk through the amusement arcade rather than along the walkways either side of the arcade. 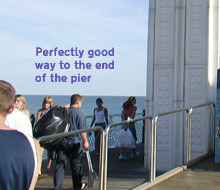 I don’t know how effective it is; conceivably some visitors might assume that it’s the only way to the end of the pier, but given how easy it is to see along the walkways either side, I’m not sure the deception is very convincing. 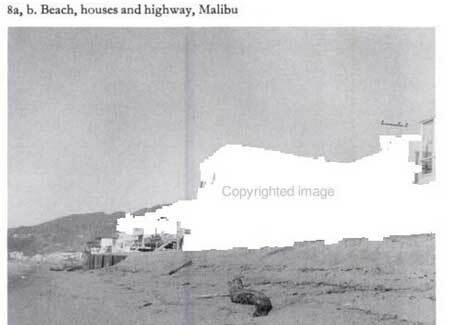 What’s the worst intentional mis-direction you’ve come across? And did it ‘work’? Flying from the new Heathrow Terminal 5 and facing a lengthy delay? No worries. Take a seat and enjoy the spectacular views through the glass walls: Windsor castle in one direction; the Wembley Arch, the London Eye and the Gherkin visible on the horizon in the other. But you had better be quick, because the vast Richard Rogers-designed terminal, due to open at 4am on March 27 next year, has only 700 seats. That’s much less than two jumbo loads, in an airport designed to handle up to 30 million passengers a year. There will be more chairs available but they will be inside cafes, bars and restaurants. Taking the weight off your feet will cost at least a cup of coffee. The new terminal may have been heralded as a “cathedral to flight”, but with 23,225 sq metres (250,000 sq ft) of retail space, the equivalent of six typical Asda stores, it is actually going to be a temple to retail. Heathrow may be packed with shops, but when the Â£4.2bn Terminal 5 opens the airport’s total shopping space will increase by 50% overnight. After security, two banks of double escalators will transport potential shoppers into a 2,787 sq metre (30,000 sq foot) World Duty Free store… Mark Riches, managing director of WDF, believes his new superstore has the best possible site to part passengers from their cash: “About 70% of passengers will come down those escalators”, he said, “and we will be ready”. He recognises he has a captive audience: “If we can’t sell to people who can’t leave the building, then there’s something wrong with us”. Mr Riches, a former Marks & Spencer executive, is planning “to put the glamour back into airport retailing” with plans for gleaming cosmetics counters and a central area reserved for beauty services such as manicures. “We are moving away from just selling stuff to providing services. This should be real theatre,” he said. He is also planning what he calls “contentainment” – the music will change according to where you are in the shop and a 14-metre-long “crystal curtain” “bigger than a double decker bus and thinner than a calculator” will show videos, advertising and sports events. 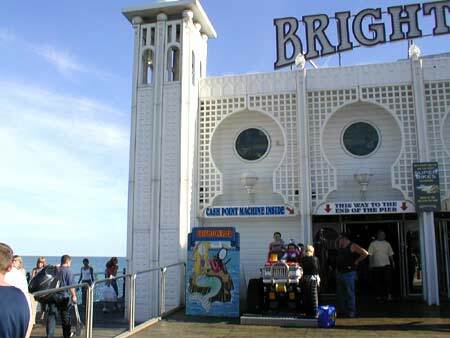 Everything about this story – from the location itself out on the bleak badlands between the M25 and A30, to the way the customers are coerced, channelled, mass-entertained and exploited, to the odd hyperbolic glee of Mr Riches’ visions for his mini-empire – seems to scream J G Ballard. If Kingdom Come hadn’t riffed off the Bentall Centre, it could surely have been about a Terminal 5. Back to the practical aspects: the deliberate removal of public seating to force passengers to patronise restaurants and cafÃ©s is in no way isolated to Heathrow. 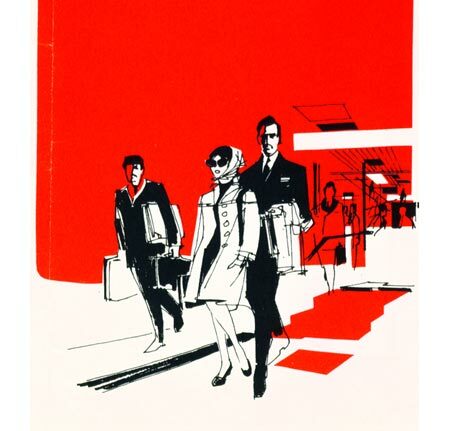 In a coming post – also suggested by Mags – we’ll look at First Great Western’s policy of doing this in some of its railway stations, with none of the glitz of Terminal 5 but all of the cold-eyed distaste for the customer. 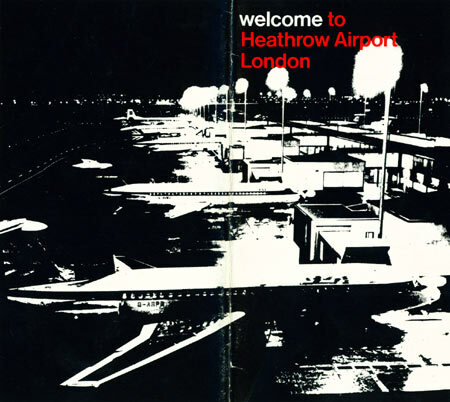 Images from a leaflet published by the British Airports Authority, 1970.